TERRE HAUTE, Ind. - Indiana State University will celebrate the 100th anniversary of Normal Hall during the 84th annual Founders Day ceremonies at 1:30 p.m. Wednesday, Feb. 11 in the Heritage Lounge of Tirey Hall. In addition to the traditional book and touch ceremony, Alberta Comer, dean of Indiana State's Cunningham Memorial Library, will speak about a stately and historic building celebrating its centennial. 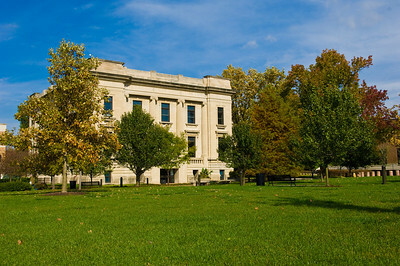 Normal Hall, one of the most beautiful and architecturally significant buildings on Indiana State's campus, was built in 1909 and dedicated as the library for the Indiana State Normal School in June 1910. The neo-classical building, constructed of Indiana limestone, was celebrated for its Italian renaissance architecture. The front of the building was highlighted by four fluted ionic pilasters and a stone stairway of 17 steps leading to the main entrance. The building's interior was equally as impressive, especially its rotunda and colorful dome of opalescent art glass. Access to the rotunda was gained through a vestibule, featuring a Roman mosaic floor and marble wainscoting. Stairways of marble and bronze rose in the southwest corners. A series of marbleized columns supported the dome. Handsome wooden appointments abounded, and the glass floors in the stacks at the rear of the room added another unique touch. The dome featured an oil reproduction of Raphael's drawing of "Philosophy" with a series of 24 stained glass panels that featured wreathed medallions pierced by flaming torches below. In the center of each wreath was an open book or scale of justice. The names of noted philosophers and educators appeared beneath the torches. For several decades, Normal Hall was the academic center of the campus. By 1940, Indiana State was home to the second largest teachers college library in the nation. In the mid-1950s, however, several alterations were made to the building in the interest of utility and necessity. First, the front stairway and entrance were moved and replaced by a ground-floor entryway. A large addition to provide book storage came later. Finally, because of maintenance problems, the dome was dismantled and the ceiling plastered. Since the opening of Cunningham Memorial Library in 1973, Normal Hall has served a variety of purposes. It is currently used for storage and office space for the Permanent Art Collection, University Archives and other administrative offices. Founders Day ceremonies are free and open to the public. A reception will follow. Please call 812-237-3707 to RSVP for the program and reception. An annual event, Founders Day celebrates the founding of the university as Indiana State Normal School in 1865 (opened in 1870). More about ISU history and traditions is available at http://www.indstate.edu/isu_today/history_trad.htm or at the University Archives site at http://indstate.edu/archives/. Indiana State University will celebrate the 100th anniversary of Normal Hall during the 84th annual Founders Day ceremonies at 1:30 p.m. Wednesday, Feb. 11 in the Heritage Lounge of Tirey Hall.